I am running late doing my post today, so apologies there. Today we are talking about Robert Oster Dark Chocolate. I'm determined to review every Robert Oster ink, but he releases new inks so often that it's hard to keep up, but I'm gonna catch them all eventually. By the way, did you see @Robertostersignature's instagram post today? He's releasing some shimmer inks for the Christmas season, and I'm so excited to try them. I'm not super excited about shimmer inks usually, but Robert Oster always does so amazing with his inks, that I think his shimmer inks are going to be amazing as well. Please, US retailers, carry them so I can get my hands on some samples. Back to Dark Chocolate...I purchased my sample from Vanness Pens. 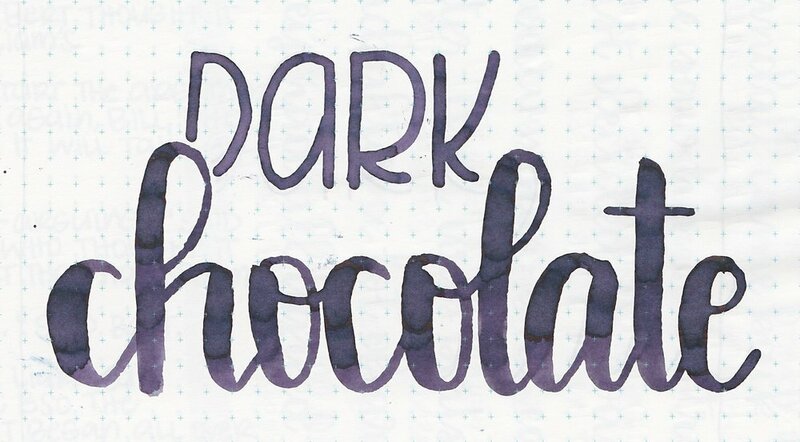 Dark Chocolate makes the ink sound brown, right??? Well, it's not-it's purple, a dark, pretty purple, but purple nonetheless. I don't know if there was a little bit of color variation between batches or not, but the ink is purple. The ink drops show off the light purple shading, and some of the coppery-brownish sheen. Let's take a look at how the ink behaves on good paper first: Rhodia, Tomoe River, and Leuchtturm. On Moleskine paper, the ink had a tiny bit of feathering, and some bleeding. If you aren't planning to use the back side of the page, you might be able to get away with using this ink on cheaper paper. Ink swabs for comparison, left to right (top to bottom for RSS): Robert Oster Golden Brown, Robert Oster Dark Chocolate, and Robert Oster Berry d'Arche. I think Dark Chocolate is a lot closer to Berry d'Ache than to Golden Brown. It's settled-this ink is purple, people, so just go with it. Click here to see the Robert Oster inks together. Montegrappa Coffee Brown, Pilot Iroshizuku Yama-guri, and Robert Oster Claret. Click here to see the brown inks together, and click here to see the purple inks together. I used a Pilot 912 FA, then switched to a broad Pilot Vanishing Point. I used Tomoe River paper. I didn't have any flow issues. Overall, this is another great Robert Oster ink, I just wouldn't suggest getting it if you are looking for a brown, if you are looking for a dark purple, than this might be the ink for you.